You've found our most popular, best selling bench! 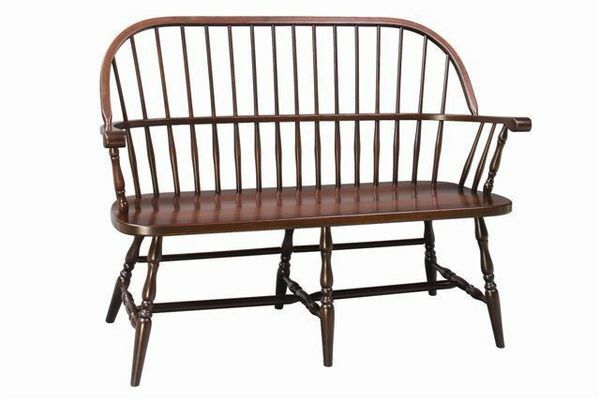 The elegant Franklin Sack-Back Windsor Bench is handcrafted using only the strongest and most beautiful solid hardwoods. It is then beautifully finished for a truly magnificent appeal. Sixteen different finishes are available for the Franklin Sack-Back Windsor Bench. For your cozy entryway, in the kitchen, or nestled next to a bedroom window, the Franklin Sack-Back offers choice seating. The sack back is one of the richest Windsor designs, with spindles worked through the continuous arm--a true feat for the accomplished woodworker. The Franklin Sack-Back Windsor Bench was chosen to be featured in Sony's Blockbuster Motion-Picture Zathura! View our entire collection of Windsor Benches for more options. Call DutchCrafters toll-free to speak to a furniture specialist with any questions or to place your order by telephone. 1-866-272-6773. You can also visit us at our store in Sarasota, Florida. Hi, Linse! We received the windsor bench, and it's fabulous! Thanks!